Brewed with the highest quality and wherever possible organic & fair trade ingredients - teas, cane sugar (or local honey), and potent tisanes (herbal teas) of spices, herbs and flowers. Catch them when you can! Low in sugar... high in energy. All-year mulled wine celebration in a kombucha, thanks to the punch of hibiscus and familiar spices of the festive season. An original Kitty's Kombucha recipe from Thailand. Hand crafted with sencha green tea, spices and cane sugar (all organic), Hibiscus Glow is a traditionally brewed kombucha in oak barrels, infused for 2nd fermentation with a tisane (herbal tea) of red hibiscus, ginger, cardamom, cloves and cinnamon. And with less than 2.5g of sugar per 100ml, it's low sugar & superbly refreshing! Alternatively, create a festive mixer poured on vodka & ice. Our first and magic "jun" (honey-brewed kombucha). Balmy local honey, fragrant jasmine and bitter orange, with elderflower notes (because that's where our honey bees go frolicking). Hand crafted with organic jasmine green tea, and nourished with local honey, Jasmine Jun is a traditionally brewed kombucha in oak barrels, infused for 2nd fermentation with an all-organic tisane (herbal tea) of jasmine green tea, orange peel and hyssop. Made with Teddington honey (batches on sale January - October 2017) and Surbiton honey (batches on sale since October 2017). Alternatively, as a frisky mixer on any bitters or gin & ice. And in this case the Universe gave wild cloves! One day a brew of Hibiscus Glow evolved with a delightful life of its own. For aficionados of clove only (even if you don't know it). Hand crafted with sencha green tea, spices and cane sugar (all organic), Wild Clove is a traditionally brewed kombucha in oak barrels, infused for 2nd fermentation with a tisane (herbal tea) of red hibiscus, ginger, cloves, cardamom, and cinnamon. And with less than 2.5g of sugar per 100ml, it's low sugar & has all the pzazz! Alternatively, create a bright mixer on gin & ice, or whichever way you wish. Honey, hemp, and bio-enhancing Ayurvedic spices. Light, spicy fresh green notes fuse with the balminess of local ethically harvested honey for this enticing "jun" (honey-brewed kombucha). 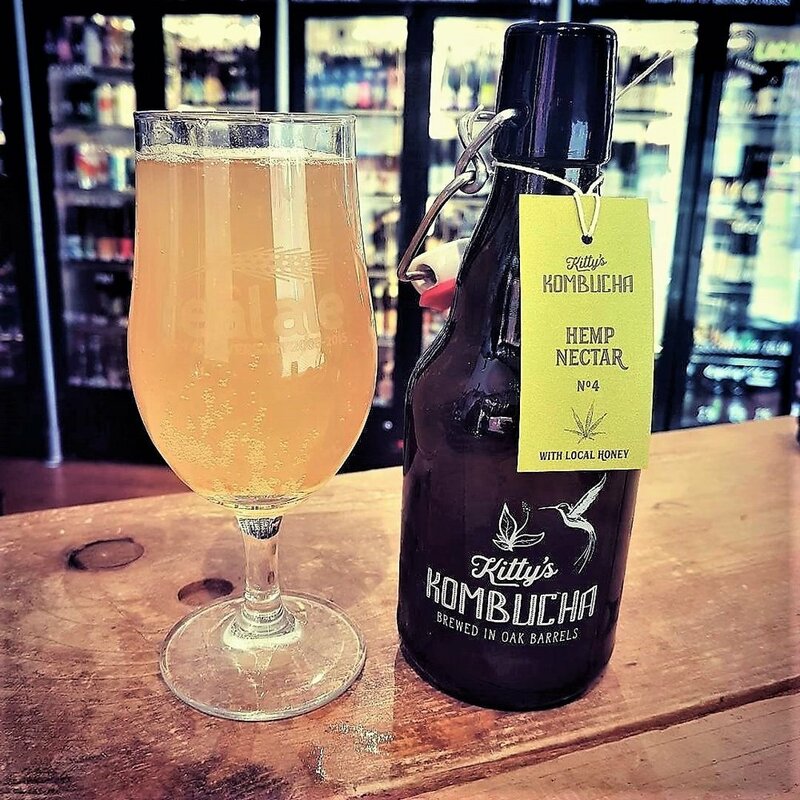 Hand crafted with organic jasmine green tea, and nourished with local honey, Hemp Nectar is a traditionally brewed kombucha in oak barrels, infused for 2nd fermentation with an all-organic tisane (herbal tea) of hemp, ginger, cardamom, cinnamon and turmeric root. Alternatively, as an elegant mixer on amber rum & ice, or whichever way you wish. Low in sugar... and wonderfully aromatic. Incredible floral Thai herbal notes, strongly evocative of effervescent happy island-living. An original Kitty's Kombucha recipe from Thailand. Hand crafted with Thai herbs, organic green sencha tea and cane sugar, Thai Island is a traditionally brewed kombucha in oak barrels, infused for 2nd fermentation with a tisane (herbal tea) of lemongrass, ginger, kafir lime leaf, galangal and turmeric root. And with less than 2.5g of sugar per 100ml, it's low sugar & just hits the spot! Alternatively, create a sprightly mixer on vodka or gin & ice, or whichever way you wish. Low in sugar... and a smooth operator. 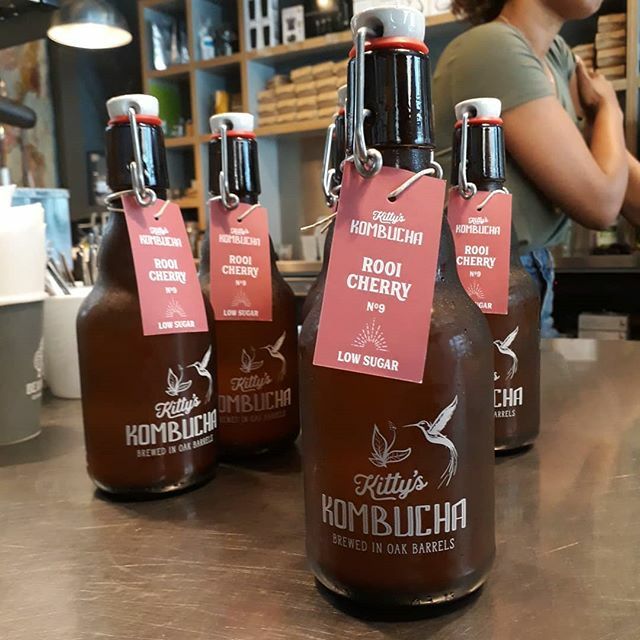 A classic British Mediterranean kombucha (if ever there was such a thing), delicately fruity, rosy, spicy - an elegant refreshing panache. Hand crafted with organic green sencha tea and cane sugar, Apple Tea is a traditionally brewed kombucha in oak barrels, infused for 2nd fermentation with an all-organic tisane (herbal tea) of fresh organic apples, rose, and a discreet dash of mint and cinnamon. And with less than 2.5g of sugar per 100ml, it's low sugar & the ideal Summer beverage. Alternatively, create a delightful mixer on vodka or rum & ice, or whichever way you wish. Low in sugar... zingy & clarity for the mind. Fresh and clean peppermint notes meet the smokiness of energising Argentinian yerba maté, sustained by a light fruity punch. 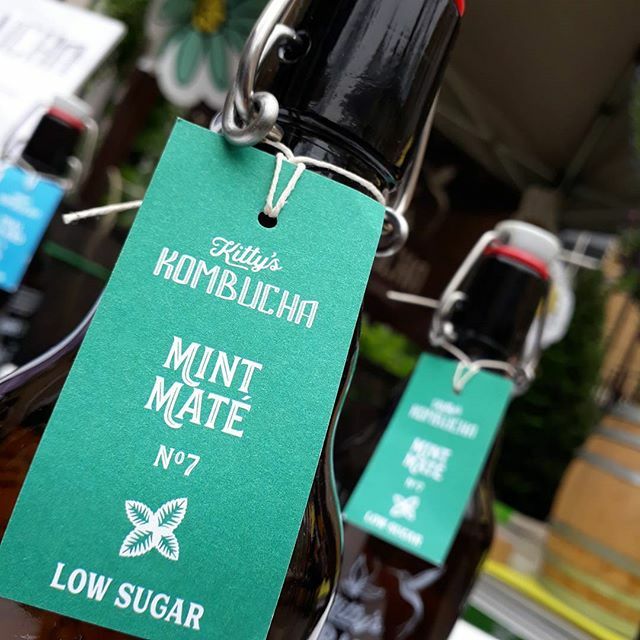 Hand crafted with organic green sencha tea and cane sugar, Mint Maté is a traditionally brewed kombucha in oak barrels, infused for 2nd fermentation with an all-organic tisane (herbal tea) of peppermint, yerba maté, ginger and red hibiscus. And with less than 2.5g of sugar per 100ml, it's low sugar & perfect mental medicine!